Try this juicy and rich chicken and leek pie. 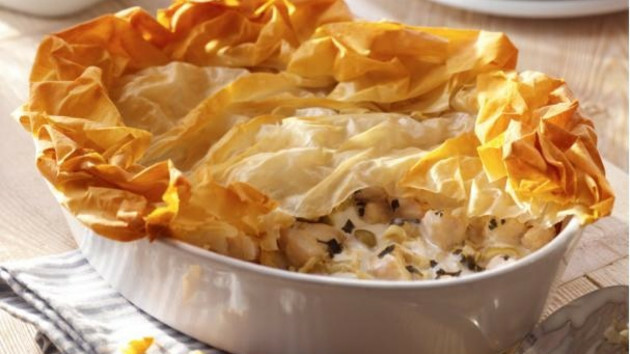 Another of Feli’s favorite, topped up with our filo sheets for a crunch everyone will love. Step 1 – Heat the olive oil in a sturdy frying pan and cook the chicken until tender for about 5-10 minutes until cooked, stirring often. Remove from the pan and leave on one side. Omit this stage if you are using cooked chicken. Step 2 – Add 1 teaspoon of butter to the same pan and soften the leeks, without colouring, for 5 minutes. Sprinkle over the flour and cook, stirring all the time, for a further 2 minutes. Step 3 Stir in the chicken stock and bring to a simmer cook for about 5 minutes until lightly thickened. Step 4 – Add the Philadelphia and stir until it has melted into the sauce. Add a dash of water if it looks a tad too thick. Step 5 – Return the chicken to the pan and add the parsley. Then spoon the mixture into a shallow, 1 litre ovenproof pie dish and leave to cool. Step 6 – Brush the edge of the pie dish with olive oil. Unroll the filo pastry and lay a sheet of pastry over the pie dish. Brush with olive oil then repeat with the other sheet. Scrunch up the overhanging pastry, fold onto the pies surface, and brush with olive oil. Step 7 – Bake in a pre heated over at 190c/ gas 5 for about 30-35 minutes, until golden and serve straight from the dish.